And so I sat on my bed in the middle of the night several months ago, pressing the phone hard against my ear as I struggled to understand my Indonesian interviewer’s rapid, accented speech over the shaky international connection. He launched into tales of grueling bumper-to-bumper traffic at all times of the day, statistics about the thick layers of smog that cover the city on most days, and warnings of dangerous neighborhoods where an unlucky traveler might get pickpocketed. With all this in mind, Josh and I hopped into a taxi on Sunday morning. 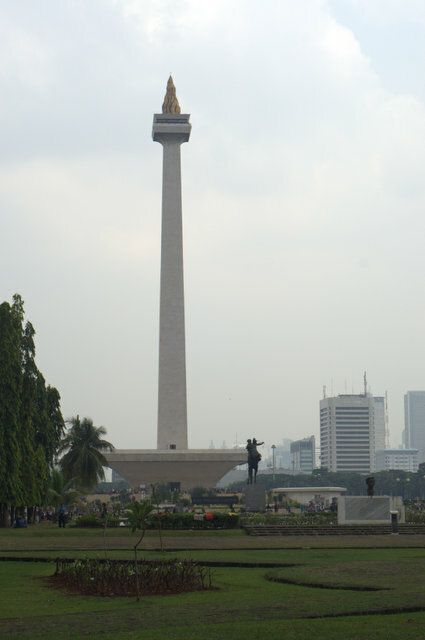 “To Monas, please!” we exclaimed, and 45 minutes later we found ourselves in the center of Jakarta, staring up at the National Monument. We battled our way through the dense, sweaty crowds and into the museum that resides at the bottom of the monument. Four walls of dioramas took us on a journey through Indonesia’s history, though we still have a lot left to learn about this country’s past. Already sticky with sweat, we decided not to wait in the sun-soaked line to go to the top of Monas, though we hope to go back soon on a day with good visibility for a bird’s-eye view of the city. Our next stop was the Istiqal Mosque and the neighboring Catholic Cathedral. Though Sunday morning sermons were in session, we could still appreciate the massive size of the mosque and the unique spires of the church; I’m hoping to take a peek inside both next time we’re in the area. Despite the heat, we decided to brave the sun and walk to our next destination. 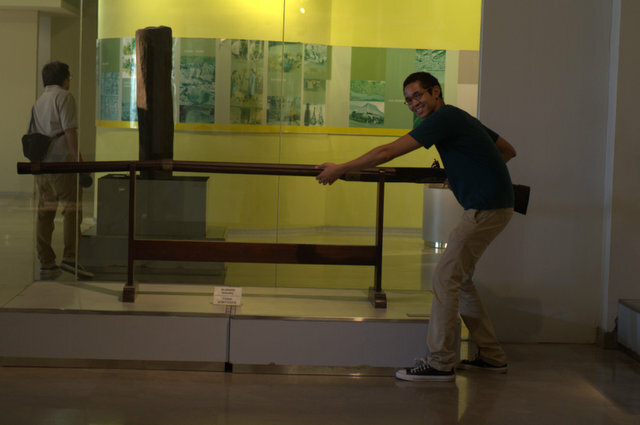 A half hour later, we were rewarded for our efforts with a cool blast of air conditioning at the National Museum. During our quick jaunt though the place, we saw tribal masks, traditional fabrics (batiks), archaeological findings, maritime artifacts, remnants from the era of colonization, and many other objects that helped chronicle Indonesia’s extensive history (and pre-history). 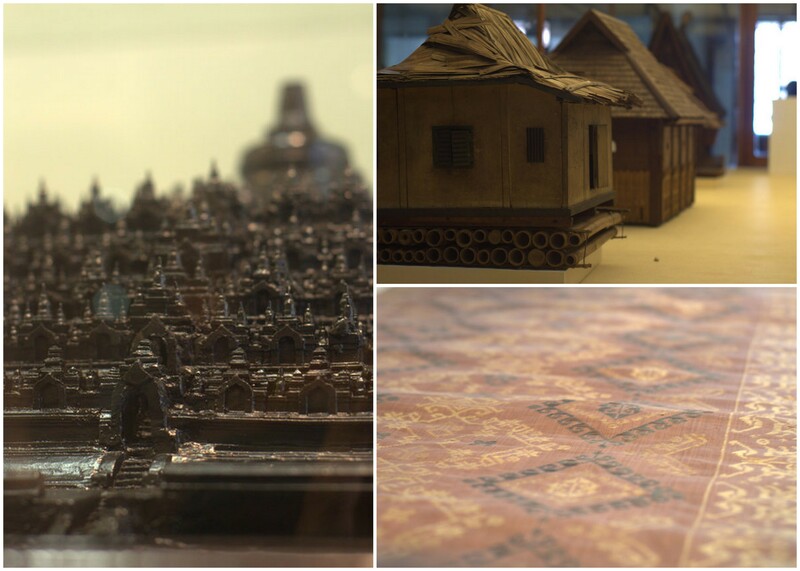 A batik and models of a temple complex and traditional Indonesian houses. I even managed to make Josh pose for an oh-so-touristy photo with this giant rifle. Embarrassingly cheesy tourist photo of Josh, hopefully the first of many! At this point, our energy reserves were running low, so we decided to indulge in Jakarta’s favorite pastime and head to a mall, where the fanciest and most extensive food court I have ever laid eyes upon provided ample opportunities to refuel. While neither Josh nor I are big shoppers, we did find it necessary to have a post-dinner browse through a shop full of English language books. The mall was also a handy place for people-watching, and the strangest thing was watching all of the wealthy people shop at designer stores while their maids trailed along afterward, in charge of the children. It wasn’t until later that we realized that almost all of the signs in the storefronts, and even the entire menu at the restaurant where we ate were in English; though almost completely devoid of any culture, the mall was still nonetheless an interesting experience and a contrast to the rest of our day in Jakarta. 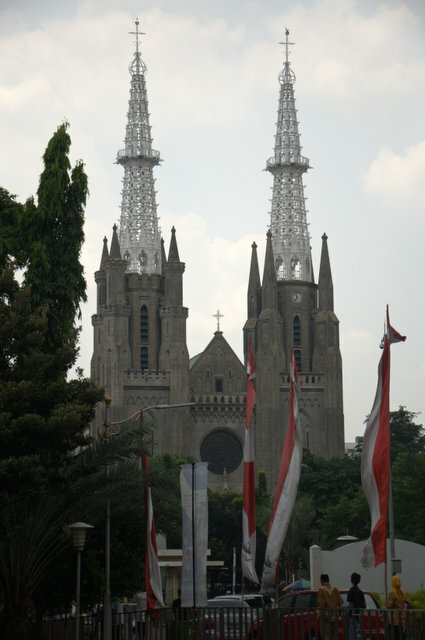 With full bellies and sore feet, we flagged down a taxi to take us home, satisfied with our first trip to Jakarta. And we had plenty of time to think about our day, since the ride home took three hours in that legendary bumper-to-bumper traffic. 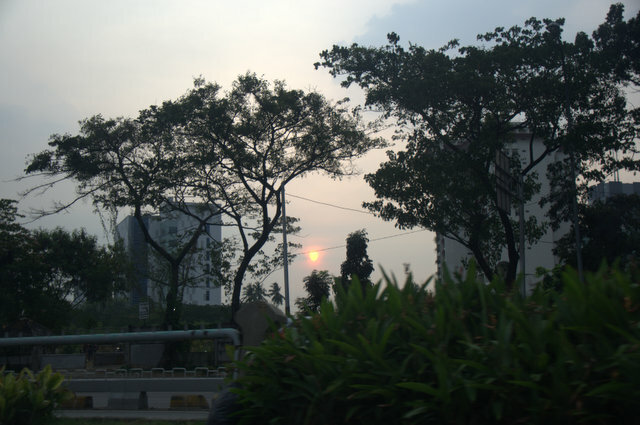 Jakarta sunset from inside our taxi. 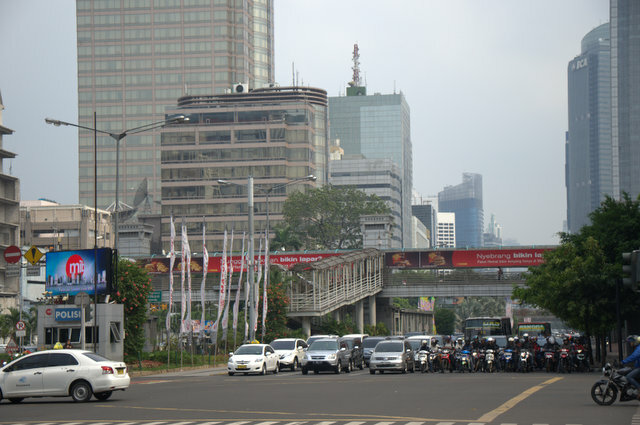 Though we did see some of the things that make people so critical of Jakarta, we also found many things to love about the capital city of Jakarta. It will probably be a few weeks before we venture back, but I am sure we will discover even more things to fall in love with next time we are there.